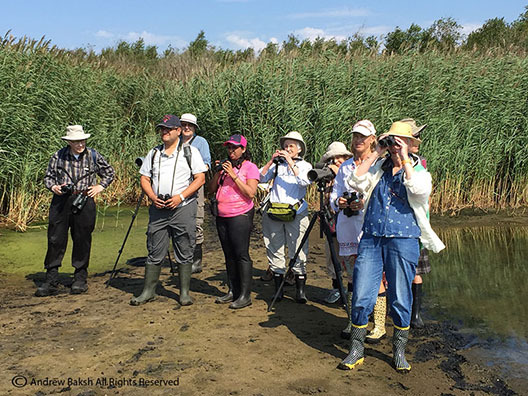 The 10th annual Shorebird Festival at Jamaica Bay Wildlife Refuge, (10th, according to the organizers) had good weather, good turnout and some good birds, even though the numbers were not that high. In total, based on feedback from all of our leaders, we had 14 species of shorebirds with our highlights being 1 juvenile Baird's Sandpiper and multiple Western Sandpipers. Non shorebird highlights included 3 juvenile Black Terns and the continuing juvenile and adult Gull-billed Terns...I thought there might have been a second adult bird but I was not sure since it was a single bird observation and could have been the one adult. 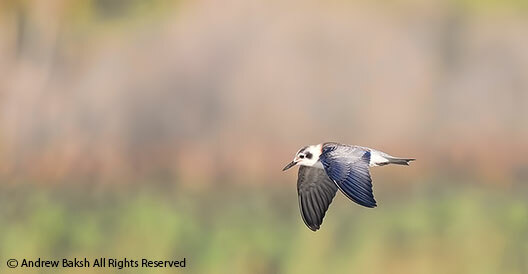 Juvenile Black Tern on the East Pond at Jamaica Bay Wildlife Refuge. The program lineup was pretty much the same as in previous years. The presentations went well and Lloyd Spitalnik's killer photographs always a crowd favorite was well received with the usual "Oohs and Aahs." The one presentation most people look forward to was just as impressive as in past festivals. 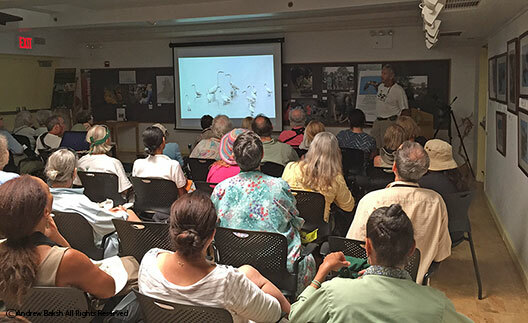 Kevin Karlson's talk on "Birding by Impression," was the talk of the town. It was the last presentation of the day but people waited patiently and it was a packed house even though it was near 4:00 p.m. when the talk began. Lloyd Spitalnik one of the organizers and leaders giving tips on ID'ing shorebirds. There was one other speaker that many birders were keen on hearing. I was on the East Pond teaching a small group who had stayed with me on how to identify Western Sandpipers when I got a text message that the superintendent of Gateway, Jennier Nersesian, had announced that they NPS, will close the breach on the West Pond. If anyone were looking at me when I read that message, they would have seen a stoic look as though it was business as usual but inside of me was sense of peace and satisfaction. At last, we have on record a commitment to close the breach on the West Pond. While the announcement did not get into all the details including a timeline on what else might be done, the mere fact that the West Pond is not being given up was a momentous achievement for those of us who were fighting hard to ensure that the pond was restored to a fresh water resource. Additionally, money has been obtained to restore the south and north gardens--all of this seems to fall right in line with the Birders Coalition wanted as outlined in the online petition. Kevin Karlson giving his "Birding by Impression" talk. Skeptics will be sure to chime in that this means nothing but it does. Closing of the breach gives this pond a chance to begin the recovery period it needs on the way back to being a fresh water resource. We have to remain positive and keep the faith. I will post more on West Pond work as I get more information. In the meantime, enjoy some additional photos of the birds seen yesterday and think about coming to the Shorebird Festival next year. 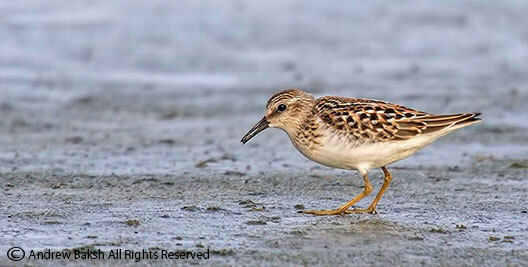 9:30 am, is not my idea of a bird walk, let alone a shorebird walk. 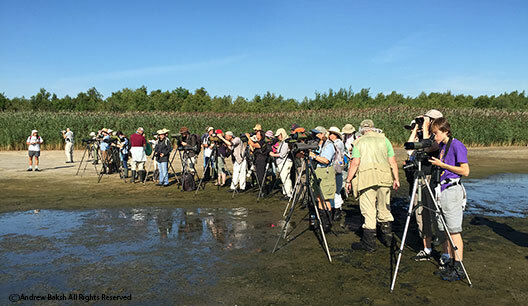 When Darren Klein of NYC Audubon approached me about subbing for Gabriel Willow in leading a shorebird walk at Jamaica Bay Wildlife Refuge, I was hesitant for many reasons. However, my love of shorebirds and teaching others the little I know won the day and so it was August 15th, that I found myself waiting at the visitor's center for my attendees. I had several friends on the Pond who were texting me intel and based on their feedback I decided, we needed to bird the north end of the pond. After working out the car pooling arrangements to get the group up to the north end, we were on our way birding, as we walked the north dyke, Willow Flycatcher, Cedar Waxwings and Catbird were some of the passerines we encountered on our way in. 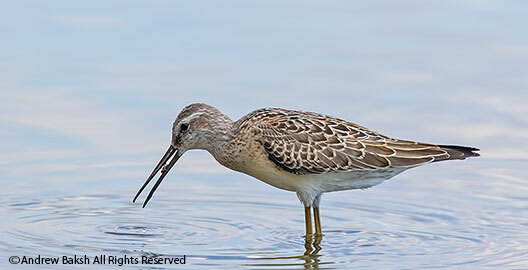 Once we arrived at entrance of the north end, I got people situated for viewing purposes and we immediately had success as the group were treated to STILT SANDPIPERS and LESSER YELLOWLEGS. Both birds feeding in close proximity, providing excellent studies. On our left, we observed Least and Semipalmated Sandpipers feeding on the shoreline and on the Algal mat. I had the group take some time to differentiate the adults from the juvenile and pointed out several nuances in separating the two species. We then carefully made our way towards the spit before Dead Man's Cove, birding as we made our way through the mud. The group was very enthusiastic despite a hot day and I kept a close eye on everyone, checking in now and again to make sure no one was wilting. Near Dead Man's Cover we continued our good run as we picked up several WHITE-RUMPED SANDPIPERS and distant PECTORAL SANDPIPERS. Semipalmated Plovers and Short-billed Dowitchers were also added to our list and a heard only Killdeer built up our shorebird species numbers. Although we missed the American Avocet which was flushed by a marauding Peregrine Falcon, which we did see, the shorebirding was fun with several attendees picking up life birds. I introduced the group to many of my friends on the pond and it was Tom Burke and Gail Benson who helped us pick up GULL-BILLED TERN. It was a distant look, not very satisfying and I hoped we had another shot at the south end. Around 12:30 we headed back to the visitor's center and broke for lunch. My regular readers will chuckle at this because they know, there is no thing as a lunch break when I am birding, but when you are leading one must think about the clients too, so lunch it was. During lunch, I spent a little time looking for butterflies near the visitor's center then met the group and suggested the south end of the East Pond. By then, it had really heated up and many birders coming off the pond from the south end relayed that there was not much to see there. At this point some of our attendees dropped out and the rest joined me for a walk on the south end. At the south end, we saw some of the same birds we had at the north end and again had a good time studying the Least and Semipalmated Sandpipers. I challenged the group to pick them out and they had fun doing just that. A sharp eyed, attendee picked out a dot perched in one of the Beech Trees near the south end and it turned out to be a juvenile Peregrine Falcons, the group all had good looks. Then I suggested walking up the east side a bit and a few more people by then decided to call it a day so an even smaller group of 6 walked up the east side towards the Raunt. I heard and then spotted the juvenile GULL-BILLED TERN and later on we had the adult. The group had very satisfying looks and I was happy that they had better looks than earlier on. A bit of pishing coaxed out a couple of Northern Waterthrushes that were giving us fleeting glimpses and the group all had nice looks at them. Scoping from the Raunt did not not pull out the American Avocet and so with the sun really cooking and the time nearing 3:00 p.m. we decided to call it ending a productive day in the field. We are into our second week in August. 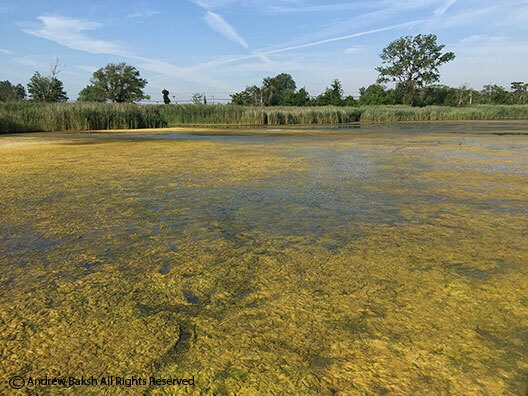 While the water level is currently where it should have been at the end of July on the East Pond of Jamaica Bay, we are faced with additional challenges that have contributed to a rather disastrous shorebird season thus far. The biggest issue outside of the water level is Algae! 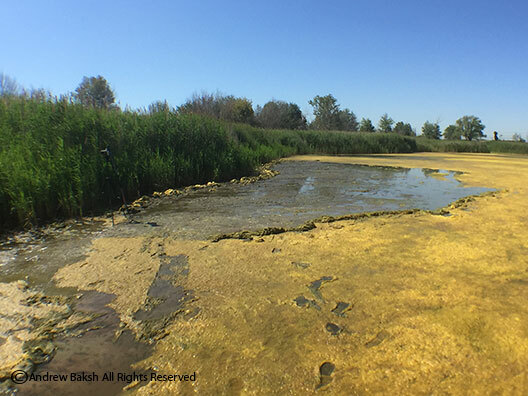 The East Pond, is laden with a thick Algal mat which has covered most of the mudflats on the north and south ends. Realizing this could be problematic, I broke some of it up on the north end while out there keeping an eye on the water level. What I did not realize was how thick it was on the south Once I got out there and saw how bad it was, I broke up many areas and even raked some spots. One area where I raked out some of the Algal mat on the East Pond. This mat is quite pervasive and has actually created feeding habitat for the smaller birds, mainly the peeps. If the birds are finding food there, I am happy for them but it creates a problem for viewers and makes surveying difficult. Photographed on July 14th, 2014 -- Note the ample shoreline on the East Pond. Photographed on August 10th, 2015. Peeps feeding in the middle of the pond on Algal mats. Note the dates in the caption of the photos and readers will get an appreciation of why I was so concerned about the water level earlier on. The data, that I have gathered over 4 seasons of monitoring the East Pond water level does not lie. But wait, there is more to add to the frustration level. Predation! Three juvenile Peregrine Falcons have been wreaking havoc on the East Pond, often flying in and taking up positions on both north and south ends. 2 of 3 Juvenile Peregrine Falcons that have caused a lot of trouble this year. This causes quite the panic and birds are often skittish, not staying long in one spot and eventually heading back out into the bay as soon as the opportunity presents itself. All of this, plus the paucity of birds adds up to a rather frustrating 2015 shorebird season. Had enough yet? Okay one more--compounding the number of issues this year, is the lack of parking for visitors interested in birding the north end of the pond. 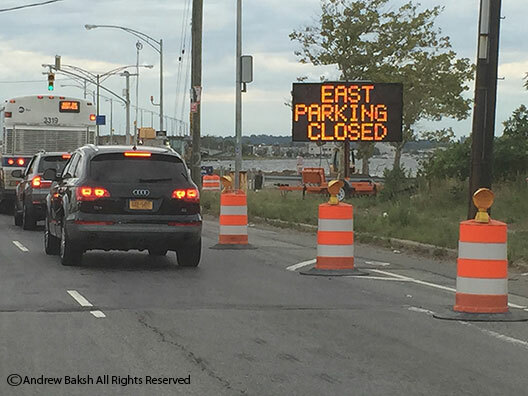 The parking lots at the North Channel Bridge have been under construction for some time (who makes these decisions to have construction done on places mostly used in the summer??). The West Lot, is completed but the East Lot is closed. The redesigned West Lot seems smaller and gets filled quickly as one birder found out on Sunday who ended up giving up and going home. This veteran birder summed up his experience for me yesterday when he stated on the phone. 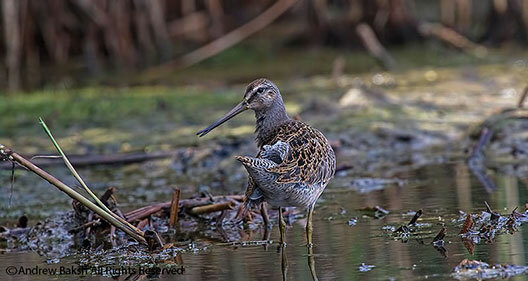 "I have been birding since the 1970's and have never seen so few shorebirds on the East Pond. It is f@Q$% depressing." His frustration no doubt exacerbated by not being able to find parking at the West Lot. 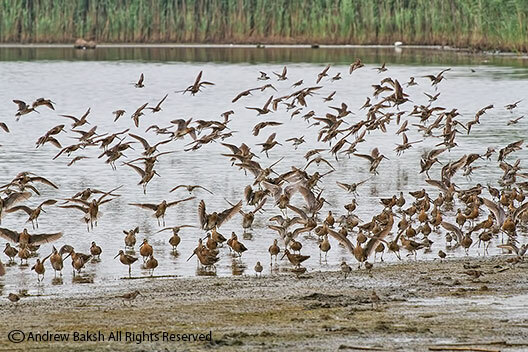 With the annual Shorebird Festival in a couple of weeks (August 29th), organizers better hope that there is a huge influx of shorebirds on the East Pond. Otherwise, they may need to have a backup plan on keeping attendees occupied. Stand up comedy anyone? 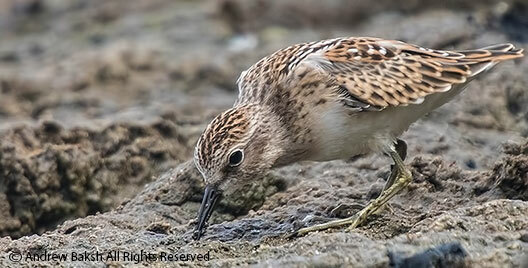 A closely cropped juvenile Least Sandpiper, photographed on the East Pond of Jamaica Bay in Queens NY. I wanted the emphasis to be be on certain field marks. Notice how fresh the plumage is on this bird.